VISALIA – Mayor Warren Gubler is leading a delegation to one of Visalia’s sister cities, Miki City, Japan this fall. Travelers will arrive in Miki City on Wednesday, Oct. 3 and their stay will extend through Tuesday, Oct. 9. The public is invited to join in this historic occasion. This trip is open to Visalia residents and all travelers, including those representing the City of Visalia. Members of the delegation are responsible for their own expenses including, but not limited to, airfare, meals and travel expenses. Members of the City delegation will fly out for Miki City on October 3rd and arrive at the Osaka International (Itami) Airport. Delegates can request a home stay with a Miki City family, or coordinate a hotel stay at a cost of $40 – $180 per night depending on amenities (higher rate accommodations include some meals). 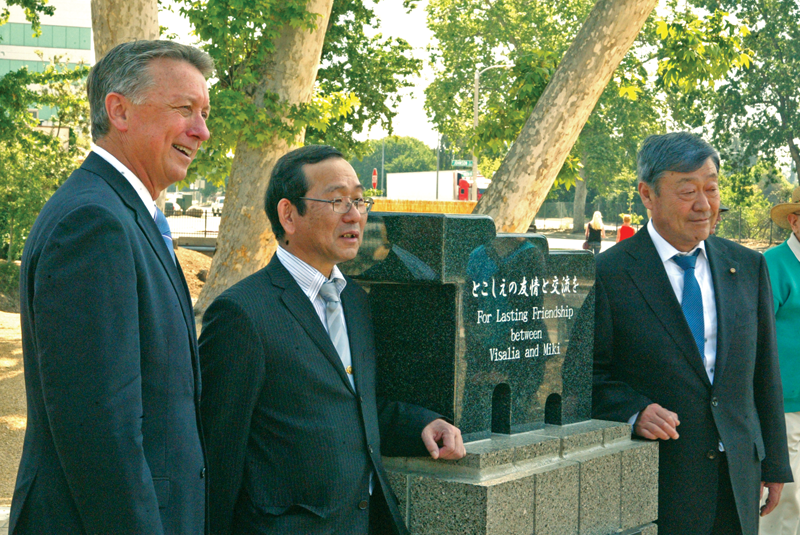 Visalia and Miki City’s sister city relationship began in 1966 with 2018 marking 52 years of friendship. Gubler led the last citizen delegation to Miki, Japan in November 2016 to mark the 50th anniversary as sister cities. Last year, a Japanese delegation of visitors was led by then Vice-Mayor of Miki, Shigetoshi Inoue and the chairperson of the Miki City Council, Minoru Hatsuda, who came for the dedication of Miki City Park, located at Mineral King Avenue and Stevenson Street. Long before becoming mayor, Gubler started his public service in Visalia by sitting on the Sister City Committee 20 years ago. The Miki City Sister City Committee furthers international understanding through the exchange of ideas, culture, education, municipal, professional and technical projects between the City of Visalia and Miki City, Japan. Gubler, who can converse in Japanese, was a missionary in Okinawa, Japan in 1976-1978. When Gubler was elected to the City Council nine years ago, one of his goals was to re-establish Visalia’s connection with its Sister City and worked toward sending Visalia’s first delegation in more than a decade to commemorate the 50-year friendship in 2016. Gubler said he was delighted to find so many similarities between the cities. Gubler said this year’s trip will differ from his first trip to Miki City because it falls at a different time of year. In 2016, the Visalia delegation arrived in November to attend the Hardware Festival, a celebration of the city’s bustling manufacturing hardware plants and its tool-making heritage. This year, the trip will take place during the Autumn Harvest Festival, a special time for Miki City and the island country as it is held around the time of the rice harvest to thank the gods for a bountiful crop. Miki City leaders will have a schedule of activities planned that allow delegates to learn more about their city and their culture. “We have spots available and people should really consider seeing Japan,” Gubler said. An informational meeting for those that would like to be a part of the delegation will be held Monday, Aug. 13 at 5:30 p.m. at the City of Visalia Administration Building, 220 N. Santa Fe, in the Conference Room. To RSVP for this meeting, or for more information on this sister city opportunity, contact City of Visalia’s Gladys Ruiz at 713-4314 or email her at gladys.ruiz@visalia.city.